Here it is! 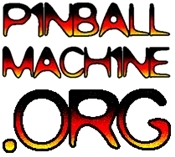 The newest pinball game by STERN pinball! Unfortunately, as you can see from the video, they screwed up and built it sideways, making it nearly unplayable. maybe they were intending to send it to a gravity free environment.